The book containing all of the Paper characters. The Paper Mario book is a key plot element in Mario & Luigi: Paper Jam. It contains the paper world of the aforementioned game. While searching for the source of a draft in the attic of Princess Peach's Castle, Luigi and a Toad discover the book on the bookshelf. Startled by a Scaredy Rat, Luigi knocks the book down, causing it to open and release various Paper characters into the world. Mario and Luigi team up with Paper Mario to track down the various Paper Toads that have been released, while Bowser unites with Paper Bowser. After making their way through Doop Doop Dunes, the protagonists lose the book to Bowser Jr. and Paper Bowser Jr., who intend to destroy it so they could stay together, but ultimately decide to keep it. Bowser and Paper Bowser discover the book themselves and intend to trap the Mario Bros. in the book and then destroy it. 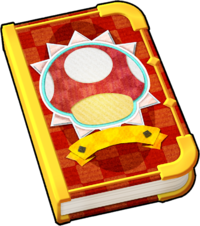 However, prior to this, the Bowsers plan to betray each other afterward, trapping the other in the book along with the trio, which they fail in doing. After the final battle with Shiny RoboBowser, Mario, Luigi, and Paper Mario trap Paper Bowser back in the book and ultimately use the book to return all of the Paper characters and Paper terrain back to their own world. This page was last edited on November 20, 2017, at 20:49.